Law of attraction, power of thoughts,subconscious mind, spirituality: How to get what you want? I, you (probably) and many will reply like below to the most asked question: What you want to be? There is a flaw in this cliche. I found out from my experience. I used to reply like that earlier in my life but it changed at the blink of an eye when I read that in order to be to get something I want, I must be joyful first. When you want something that can create certain vibration (for example: joy) in you, you must first produce the same vibration with in you to attract vibration of similar wavelength. Unless you are joyous at present, you can't expect to attract materials, events, situations that can give you joy, however you pray for or apply other law of attraction methods like affirmations and visualization. Only positive vibrations can attract positive vibrations. However there is another issue hidden in this: If you are already joyful even without any external material or conditions, then, why should you want anything for? I hope you catch the essence of this law of universe. Now, how do you raise your vibrations? Well, each one follow their own method. I look at pictures like this. 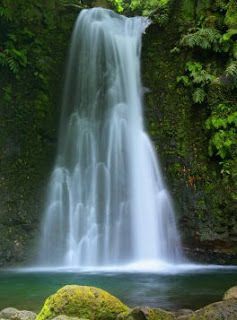 It is a waterfall in Azores Island. You are absolutely correct. We are not going to attract anything positive when we are miserable no matter how hard we pray and visualize. Photographs do help a lot! Interesting post on how to get what we want. As James Allen have written, we can get what we want when our wish harmonize with our thoughts and action. So it's necessary to feel having what we want, although we have not gotten it. Thank you Avatar. James Allen is a prodigy. I read his daily notes even now. We blog on similar topic. Wonder will you exchange links with me.